MASTER PROBLEMS People and Society How to help a road accident victim? How to help a road accident victim? Where injuries are not irreparable, everything depends on the rapidity and effectiveness of the assistance given." 1. Alert those who specialize in rendering first aid. 2. Be sure not to undertake any action liable to harm the injured victim further. The first point is not always as simple as it may seem. The person witnessing an accident, especially if it happens at night or at dusk, does not always know how to get in touch with the relevant first aid responders. In most cases, even if he or she manages to inform them, they do not arrive on the spot. It may take them from 10 to 30 minutes for them to arrive. 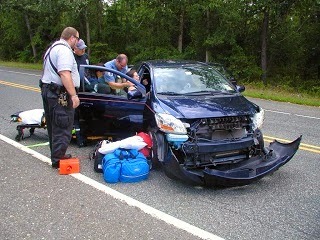 Unfortunately, at those times voluntary helpers on the accident scene do things that worsen the state of the injured. For example one accident victim's spine was seriously injured in the cervical region due to the effect of deceleration. He should have been lifted out of his automobile with great caution and held perfectly straight from the head to the pelvis. Then placed on a hard flat surface and taken to hospital by an ambulance. However, those on the scene of the accident took no such precautions, and he was taken to a hospital in a sitting position by a private car. When he arrived he was dead, his spinal cord was not able to stand up to this handling. Also is during a Tour de France competition, a racing cyclist had a bad fall into the ravine. The person who went to his help lifted him up by holding the upper portion of his body and also his legs, thus bending his body. This position caused an injury to the spinal cord at the spot where the spine fractured, thus his legs were immediately paralyzed. 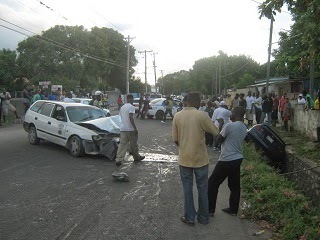 So, what should a person do in a positive way to render assistance to a road accident victim? 1. Do not move the victim unless the person is in immediate danger of further injury. Never urge an injured person to sit up, stand or walk until proper assistance arrives. If the person must be moved, do so with the greatest care, with the body always maintained absolutely straight. To avoid worsening any existing injuries, never bent or twist the victim. 2. The victim should be laid out flat with the head low and feet slightly higher to enable blood to flow easily to the brain. This will help to avoid the brain from being deprived of oxygen, particularly at the base of the brain which governs the activity the heart and lungs. 3. Make sure the victim is breathing, or else all other aid will prove futile. If unconscious, the victim’s mouth could be opened to see if he or she has swallowed the tongue. If so, you can pull it out to prevent suffocation. Where artificial respiration seems necessary, the mouth to mouth procedure should be used if one is at all familiar with it. Other artificial respiration methods that require applying pressure should never be used. If the spine is broken, these movements and pressures could prove fatal. 4. If the breathing is satisfactory, look carefully for any visible signs of bleeding and apply a pad of some kind firmly against the wound. This is usually preferable to a tourniquet, which can render impossible, later on, the grafting of a vein or artery. It has been responsible for the amputation of limbs. 5. Loosen tight clothing without moving the victim. If the person vomits or seems likely to, gently turn the persons head to one side so that the victim does not swallow the contents of the stomach and impair the persons breathing. Do not give an unconscious person anything to drink. Keep the victim warm and comfortable as possible until help arrives. 6. You should have already sent someone to call for medical aid. But if you have been alone, then at this point, with the breathing and bleeding of the victim attended to, tell the person if conscious that you are going for help and do so immediately. But why not, if you are alone, go for help before this? Because if the patient cannot breathe or is bleeding seriously the person may die before aid comes. These two vital points must be taken care of. But usually, at the scene of the accident, there are others that you can send for help as you begin to administer assistance. What are some of the types of injuries accidents victims suffer? The most difficult to notice are internal injuries, by the time these internal injuries are discovered it is often too late. They prove to be fatal. In most cases of death due to internal injuries are produced by sudden deceleration. It has been estimated that in the case of sudden stopping of a vehicle in a collision, the force and pressure of impact equals half the weight of victim multiplied by the square of the speed at which the car was traveling. Let us illustrate the point mentioned above. If in a train, then someone pulls the alarm signal and the train suddenly stops, passengers and luggage are thrown forward. The force of deceleration has catapulted them in the direction in which the train was travelling. The force is such that the sudden stopping of a car traveling at 30 miles per hour corresponds to a fall of 30 feet. At 50 miles per hour, however, the force is equivalent to a fall of 72 feet. And at 60 miles hour, corresponds to a fall of 130 feet, about same as a fall from the top of a 15 story building. It has been calculated that a man weighing 155 pounds and travelling at 40 miles per hour develops a force at of about 9 and half tons! This is sufficient to bend steel bars at time of impact. So the same thing that happens to luggage rack of the train happens to the internal organs of human body, which organs are more or less mobile in their natural cavities. The effect of sudden stopping of the vehicle travelling at 50 miles per hour is said to give an apparent weight of 63 pounds to the brain, which actually weighs only a little over 3 pounds. The liver, which weighs almost 4 pounds, acquires an apparent weight of 84 pounds, while the heart, which weighs less than a pound, acquires an apparent weight of fifteen pounds. All these vital organs vital organs crash against the front wall of the natural cavity with a force more than 10 times their normal weight. The violent impact causes considerable internal damage, which is very difficult to detect right away. In a bad accident the bronchial tubes of the victim can break open, the spleen and the duodenum burst. The smaller blood vessels may be torn, the spinal cord stretched, dislocated and tissues cracked and crashed. These are the typical internal injuries caused by road accidents. They are extremely had to detect and yet cause most of the deaths. Badly injured victims of road accident often die of asphyxia when the base of the brain is deprived of oxygen either because of serious hemorrhage or because of injuries to vital organs caused by rapid deceleration. It follows that in such injuries the breathing of the victim must be maintained. This is, in fact, one of the principal rules that apply to medical assistance. Unfortunately, the injuries caused by deceleration are not the only ones to which the victims of traffic accidents are liable. Two other kinds of injuries also occur, sometimes simultaneously. The second type is directly due to the crash against an obstacle such as steering wheel, windscreen or dash board. These injuries include fractured skull, bones and hemorrhaging. A third kind of injury is an indirect result of the same impact. Under the weight of the head, the spine is violently bent at the neck or at the back causing serious complications in the form of injuries to the spinal cord. So, victims of traffic accidents suffer three kinds of injuries, those of the internal organs caused by sudden deceleration, those caused by direct crash against body of a car and those caused by indirect shocks, such as the bending of the spine. The terrible state of some injuries seriously makes any treatment quite useless for the victim for they have suffered irreparable injuries to the skull, brain, heart, blood vessels or other vital parts of the body. However, where injuries are not irreparable everything depends on the rapidity and effectiveness of the assistance given. Basically, what the above suggestions mean is that you should take minimum steps until competent help arrives. But if you have serious doubts as to what to do, it is better to do nothing, for may have died simply because of the incompetence of the aid rendered, whereas just a quarter of an hour later specialized first aid workers could have acted much more efficiently.